A “blue wave,” a host of Democrats unseating Republican members of Congress and flipping the House, is supposed to hit the country this November. One place the Democrats are trying to make that happen is California's 10th Congressional District in the Central Valley. Republican Jeff Denham is running for his fourth term and his challenger is Democrat Josh Harder, a political newbie. 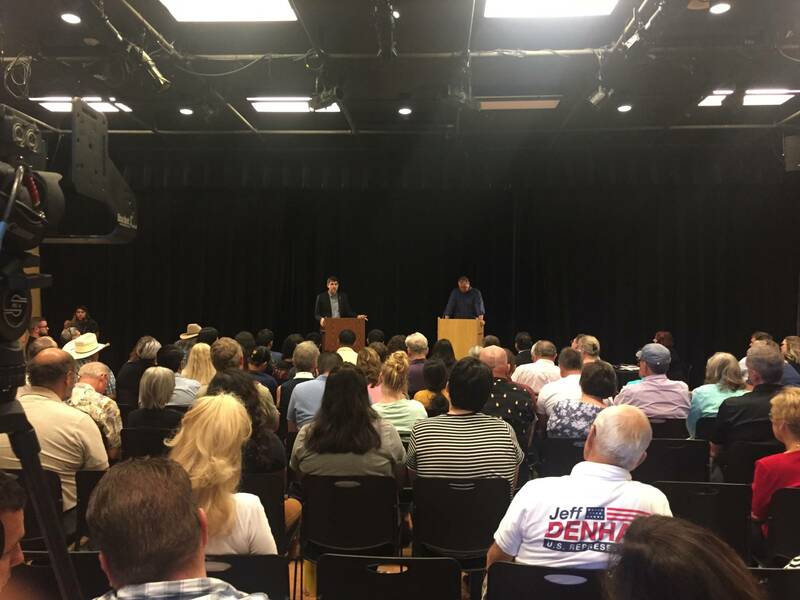 The two sparred about local issues like water and tax cuts at a debate on Saturday in Turlock. Denham tried to paint Harder as an outsider, calling him "Bay Area Harder." The 32-year-old Harder only recently started voting, a point Denham capitalized on. "You know it's one thing to criticize my position. But at least show up to vote," Denham said. Harder didn’t deny it, admitting he had spent a long time being complacent until the 2016 election fired him up. Harder grew up in Turlock and his family has been here for generations, but he did work in the Bay Area as a venture capitalist until last year. Harder held his own when tackling local issues, but he also aligned himself with the national progressive movement and focused on health care. He repeatedly slammed Denham for voting for the Obamacare repeal in 2017. "A hundred-thousand residents in this district would lose health care because of that. A hundred thousand. My younger brother David right here is one of them," Harder said. This district did vote for Hillary Clinton in the 2016 election. Harder hopes to build a coalition of Latino voters, Bay Area transplants and locals who are fed up with Trump. Mike Madrid is a Republican political consultant. He says there is a coalition of anti-Trump voters, but admits voter turnout was lacking. "In the midterm election, there was not a big enough turn out of Bay Area or Latino voters to make this a competitive or good looking race for Josh Harder," Madrid said. And, on average, incumbents win their re-election about 90 percent of the time.